BACKGROUND AND PURPOSE: Congenital cytomegalovirus (CMV) infection can cause a wide range of brain anomalies. These changes have been well described postnatally, but descriptions of their in utero evolution are scarce. The purpose of this study was to analyze the sonographic spectrum of intracranial abnormalities in fetuses with proved CMV infection and to determine characteristic patterns of this infection. METHODS: We reviewed the transabdominal and transvaginal sonograms of eight fetuses with proved CMV infection. The sonographic analysis searched for signs of ventriculitis, leukomalacia, calcification, vasculitis, and periventricular cyst formation. The gyral pattern, corpus callosum, and cerebellar morphology also were examined. Fetal MR imaging was performed in two cases. RESULTS: The sonographic diagnosis of suspected CMV infection was made at a mean gestational age of 27.5 weeks (range, 22–37 weeks). An abnormal pattern of periventricular echogenicity was found in all fetuses. Echogenic intraparenchymal foci and ventriculomegaly were present in five fetuses. Other signs of fetal infection were intraventricular adhesions, periventricular pseudocysts, sulcation and gyral abnormal patterns, hypoplastic corpus callosum, cerebellar and cisterna magna abnormalities, and signs of striatal artery vasculopathy. For all fetuses, transvaginal sonography provided additional information. Fetal MR imaging provided additional information in one case. CONCLUSION: The presence of the described sonographic findings, particularly if two or more are present in the same fetus, is an indication for CMV investigation. Congenital cytomegalovirus (CMV) infection is a leading cause of intrauterine infection and brain damage in children (1–3). Primary infection occurs in as many as 2.2% of pregnant women (4) and serologic or culture evidence of intrauterine CMV infection has been reported in 0.2–2.2% of all live-born neonates (5). An increase in the prevalence of CMV infections has been observed in recent years, and CMV infection may become even more common in the near future (1, 6). Screening strategies for the detection of women infected during pregnancy have not been implemented in Israel, and according to the Ministry of Health recommendations, only women considered at risk should be serologically tested during the 1st trimester of pregnancy. This implies that, at least in some cases, sonographic examinations performed during pregnancy may be the only tool available to identify an affected fetus. Even if the entire pregnant population would be screened by immunologic studies in the 1st trimester, clinical and laboratory evidence proves that at least some cases of fetal infection are due to maternal reinfection with a different CMV strain (7). In these cases, the sonographic examination may be the first means of raising a suspicion of intrauterine CMV infection. Imaging studies (sonography, CT, and MR imaging) of infected children show a wide range of brain findings (8, 9). Brain imaging studies of affected fetuses are limited to a series of 19 cases with diverse infective causes, including CMV, (10) and to a report of three cases diagnosed during the 2nd and 3rd trimester (11); both articles were published before the advent of transvaginal sonography. Other reports are anecdotal (12, 13). The purpose of this study was to analyze brain sonographic findings in fetuses with serologic, culture, and/or histologic confirmation of congenital CMV infection. We reviewed the brain sonograms of eight fetuses with intrauterine CMV infection diagnosed at our prenatal diagnosis unit during the 6-year period ending in March 2002. The sonograms were obtained, in all cases, by using a combined transabdominal and transvaginal approach. Axial views were usually obtained by the transabdominal approach, and coronal and sagittal views by the transvaginal approach. The sonographic equipment used included an Elscint 1000 (Elscint, Haifa, Israel), an HDI 3000 (ATL, Seattle, WA), and a Logic nine (GE Medical Systems, Milwaukee, WI) with 3.5- and 5-MHz transabdominal probes and 6.5- and 4–8-MHz transvaginal probes. The same examiner (G.M.) performed all the examinations. The sonographic analysis was aimed at signs of ventriculitis, leukomalacia, calcification, vasculitis, and periventricular cyst formation. The gyral pattern, corpus callosum, and cerebellar morphology were also examined. Fetal MR studies were performed in two cases by using a 1.5-T system (GE Medical Systems). After a localizing gradient-echo sequence, ultra-T2-weighted single-shot fast spin-echo MR images were obtained according to fetal position in the axial, coronal, and sagittal planes with the following parameters: 52/90/0.5 (TR/TE/NEX), bandwidth of 32 kHz, field of view of 16 × 28 cm, matrix of 256 × 192, section thickness of 3–5 mm, and gap of 0–1 mm. A torso phased-array coil was used. An experienced pediatric radiologist (L.B.S.) analyzed the MR images. A team that included obstetricians, pediatric neurologists, and geneticists gave counseling to the expectant parents regarding the significance of the findings and their prognosis. Amniotic fluid shell vial assay and polymerase chain reaction, fetal blood CMV-specific immunoglobulin M antibodies, and/or histologic demonstration of CMV confirmed CMV infection in all eight cases. Other TORCH (toxoplasmosis, other [viruses], rubella, cytomegalovirus, herpes [simplex virsuses]) infections were ruled out by the use of serology tests; Toxoplasma gondii was not found in any of the pathology specimens. Six women opted for termination of pregnancy. Postnatal evaluation and brain imaging were performed in the two surviving infants. Periodic follow-up was performed at the child neurology clinic. A comparison between the sonographic and pathologic findings was performed in the six cases in which a postmortem examination was obtained. Intracranial signs suggestive of intrauterine infection were identified at a mean gestational age of 27.5 weeks (range, 22–37 weeks). Six women were referred for consultation to our clinic because of abnormal sonographic findings: ventriculomegaly (n = 3), small biparietal diameter and head circumference with parenchymal echogenicities (n = 2), and suspected bilateral occipital cysts (n = 1). One woman was referred because of an abnormal triple test and oligohydramnion, and in another woman fetal CMV infection was suspected during routine sonographic examination on the basis of the presence of periventricular echogenic signal with cystic components. Five women underwent previous sonographic examinations that had been considered normal at 16–32 weeks of pregnancy. In these women, the time that had elapsed between the last examination that was considered normal and the index scan ranged from 3 to 8 weeks (mean, 5.8 weeks). Different patterns of periventricular abnormal echogenicity were observed by the use of transvaginal sonography in all cases: in four fetuses, the periventricular germinal matrix was hyperechogenic with well-defined borders (Fig 1), in two fetuses the pattern was echogenic and well defined but with cystic formations (Fig 2A). 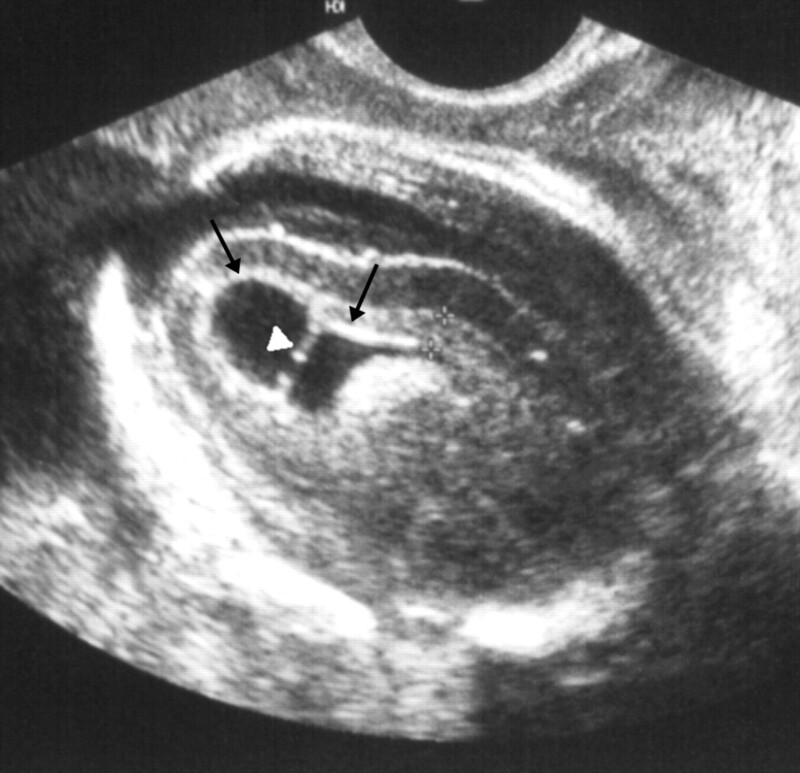 In the remaining two fetuses, the periventricular tissue was observed protruding through an undefined ependyma (Fig 3). Echogenic intraparenchymal foci consistent with calcifications were observed in five fetuses (Figs 4, 5A), ventriculomegaly was present in five fetuses (Fig 2). A large cisterna magna was found in four fetuses (Fig 2B); in two of these fetuses, the vermis was found to be hypoplastic (Fig 2B), and in one cerebellar calcifications were observed (Fig 5C). Intraventricular adhesions were present in three fetuses (Fig 1), and periventricular cysts in another three (Fig 3B). Patterns of abnormal sulcation were seen in three fetuses (Figs 4, 5A), and were associated with a hypoplastic corpus callosum in two (Fig 5B). In one fetus, signs of striatal artery vasculopathy were observed (Fig 2A) (Table). Liver calcifications, present in two fetuses, were the only extracranial sign of infection observed. Parasagittal transvaginal sonogram of the fetal brain at 25 weeks’ gestation shows abnormal periventricular hyperechogenicity (arrows) and intraventricular adhesion (arrowhead). A, Parasagittal transvaginal sonogram of the fetal brain at 22 weeks’ gestation shows abnormal periventricular echogenicity with cystic formation (arrow) and striatal artery vasculopathy (arrowhead). Observe the presence of ventriculomegaly. B, Sagittal transvaginal sonogram shows large cisterna magna (cm) and 4th ventricle (v), with hypoplastic vermis (arrow). 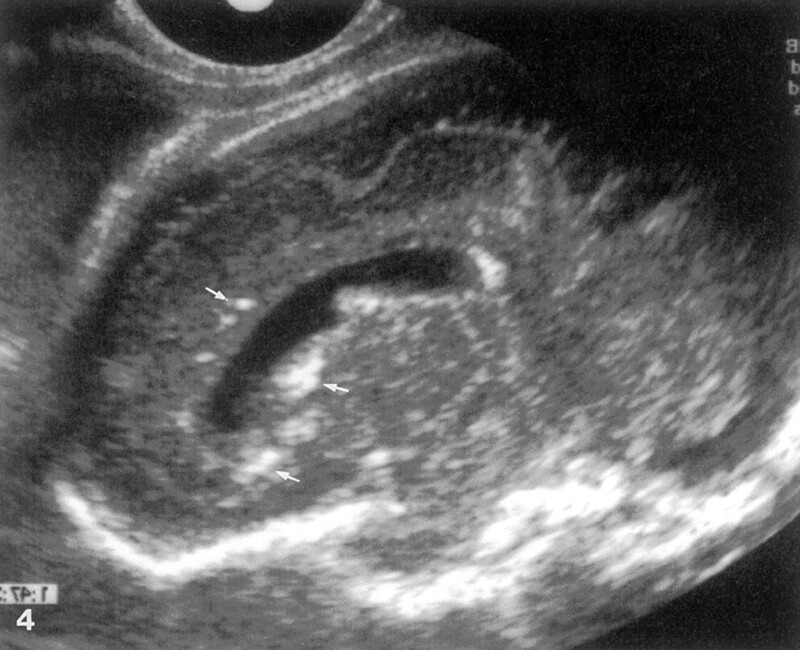 A, Parasagittal transvaginal sonogram of the fetal brain at 37 weeks’ gestation shows periventricular tissue protruding through an undefined ependyma (arrow). B, Parasagittal sonogram shows a periventricular cyst (p) protruding into a large lateral ventricle. Parasagittal transvaginal sonogram of the fetal brain at 31 weeks’ gestation shows abnormal underdeveloped pre- and postcentral gyri and calcifications (arrows). A, Coronal transvaginal sonogram of the fetal brain at 29 weeks’ gestation shows parenchymal foci of increased echogenicity consistent with calcifications (solid arrows) and abnormal sulcation (open arrows). B, Sagittal transvaginal sonogram shows hypoplastic, blurred corpus callosum. The genu of the corpus callosum is not observed (open arrows), the splenium is thin (solid arrow). csp indicates cavum septum pellucidum. C,Sagittal transvaginal sonogram shows cerebellar echogenic foci (arrow). Transvaginal sonograms in coronal and sagittal planes provided additional information to that obtained with transabdominal sonography, by better elucidating the germinal matrix abnormalities and enabling visualization of the corpus callosum, posterior fossa structures, and patterns of abnormal sulcation. MR imaging confirmed the presence of ventriculomegaly but failed to demonstrate the echogenic intraparenchymal foci observed on the sonogram in one case. In the other fetus, MR imaging added additional information by demonstrating abnormal signal intensity of the periventricular white matter in the occipital and frontal regions. Six women opted for termination of pregnancy, and fetal blood serology and/or postmortem examination confirmed the diagnosis. In the two surviving children, the diagnosis was confirmed by serology tests and direct culture of CMV from the urine. One child with isolated periventricular echogenic signals with cystic components is developing well at age 4 years; the other child is severely affected at 12 months. Based on maternal serologic studies, CMV infection was considered primary in seven cases and a reinfection in one. Maternal CMV infection is usually asymptomatic or may manifest as a mild flulike illness. However, because as many as 80% of pregnant women are CMV seropositive, universal screening is not warranted (6). Fetal CMV infection remains undetected with routine sonography in most cases (14). Among infected neonates, 90–95% are asymptomatic at birth, but almost 30% develop late complications in the 1st year of life (5). Recent data from the Houston Congenital CMV Longitudinal Study Group (15) show that the presence of microcephaly at birth or an abnormality detected with CT in symptomatic children is a specific predictor of poor cognitive outcome. Abnormal CT findings including white matter lucencies, ventriculomegaly, intracranial calcifications, destructive encephalopathy, brain atrophy, and neuronal migration disorders were present in 78% of the patients (15). This study emphasizes the importance of CMV infection stigmata recognition with fetal sonography. These signs are well described in the neonatal literature (9, 16) but are less familiar to those performing obstetric sonography. Drose and colleagues (10), in a study using the transabdominal approach, reported on 19 fetuses with suspected congenital infections. Ten fetuses had well-documented CMV infection, but only five presented with CNS findings. These findings included periventricular calcifications, hydrocephalus, inhomogeneous brain parenchyma, “diffusely abnormal brain,” and microcephaly. Of the five fetuses, three died at birth, one was aborted at 23 weeks, and the surviving infant had hearing loss and developmental delay at 18 months of age. Tassin and colleagues (11) reported the following sonographic findings in three cases of intrauterine CMV-infected fetuses, diagnosed during the 2nd and 3rd trimester: multiple periventricular hyperechogenic foci and a small cerebellum, moderate ventriculomegaly with hypoechoic periventricular rings, and severe distortion of the cerebral architecture. Achiron and coworkers (12) described a fetus with CMV infection diagnosed at 30 weeks due to the presence of mild ventriculomegaly with bilateral synechia in the occipital horns associated with two subependymal cysts and punctate hyperechogenic foci. In our study, we found three fetuses with intraventricular adhesions. In one case, this was the only significant finding in the initial sonographic evaluation, but after 1 week (the time elapsed while waiting for the results of the amniocentesis) a periventricular irregular pattern was observed in the germinal matrix adjacent to the occipital horns. In the other two fetuses, other signs of infection were accompanied by intraventri-cular adhesions. In all eight fetuses, some form of altered periventricular echogenicity was observed. This pattern may be due to periventricular calcifications or edema as a result of transependymal resorption of CSF (17). Periventricular cysts and germinal matrix necrosis develop during the 2nd trimester of pregnancy; by the time the germinal matrix vascular pattern becomes more complex and vulnerable. Fetuses with normal gyral patterns and periventricular echogenicities are probably injured during the 3rd trimester and may have active infections at birth. The normal development observed in fetus 4 may be explained by the fact that the periventricular lesion was relatively well localized and isolated or to the observation that in some cases in utero healing may occur (18). Anomalies of the cerebellum on MR images (9) have been reported in association with CMV infection in children. Cerebellar anomalies were seen in two fetuses in our study (Figs 2B, 5C). The presence of these lesions suggests that the CMV infection occurred before 18 weeks, the time at which the cerebellum ends its formation. Since pregnancy was terminated close to the diagnosis of CMV infection, we do not have a follow-up of the developing abnormalities in most of the fetuses. However, in fetuses 7 and 8, we could observe the appearance of periventricular blurred echogenicity protruding into the lateral ventricles on follow-up sonograms (Fig 3). In three cases with gyral and sulcation anomalies, pathologic examination showed polymicrogyria in two cases; the remaining surviving infant had a significant delay in sulcation with increased amount of subarachnoid fluid. These fetuses were probably injured between approximately 18 and 24 weeks gestational age. The use of transvaginal sonography enabled a much better resolution of the brain in all our cases and permitted a detailed study of the periventricular parenchyma, gyri and sulci, corpus callosum, and infratentorial structures. Fetuses with CMV infection affecting the brain may present with a wide range of intracranial abnormalities. The finding of abnormal periventricular echogenicity in association with diffuse lissencephaly or cortical dysplasia and cerebellar hypoplasia may suggest the presence of congenital CMV infection (17). A clinical suspicion or serologic evidence of maternal CMV and/or abnormal fetal sonographic findings should prompt a detailed examination of the fetal brain, preferably by transvaginal sonography. The demonstration of findings suggestive of CMV infection such as abnormal periventricular signals, intraparenchymal echogenic foci, intraventricular adhesions, ventriculomegaly, altered sulcation and gyral patterns, and cerebellar anomalies should be an indication for amniocentesis for demonstration of active CMV infection. The combination of these findings is associated with a poor neurodevelopmental outcome, and termination of pregnancy should be considered. Accepted after revision August 15, 2002. Is lenticulostriated vasculopathy a sign of central nervous system insult in infants with congenital CMV infection?